Alyson Ackerman has built an impressive list of accomplishments in environmental law while working for clients in diverse areas that include steel production, scrap metal recycling, environmental advocacy, and special districts. Alyson counsels her public and private clients on water rights law, environmental litigation, and air quality law issues. She works closely with her clients to develop, perfect, and defend water rights portfolios as well as represent their interests to the State Water Resources Control Board in prospective regulatory matters. Alyson’s air quality practice involves helping clients attain compliance with state and local air quality standards for stationary and mobile sources and negotiating settlement in enforcement actions. Alyson also practices employment law to counsel public clients on various public employment issues, and assists in providing outside general counsel services to the firm’s special district clients. Her experience includes providing advice and counsel on the Meyers-Milias-Brown Act, the Ralph M. Brown Act, the Public Records Act, the Labor Code, and the Government Code. Prior to joining Somach Simmons & Dunn, Alyson worked for a boutique environmental compliance and litigation law firm where she helped clients seek recovery of cleanup costs associated with contaminated land, amend air permit limits, and determine the need for a section 404 permit under the Clean Water Act. 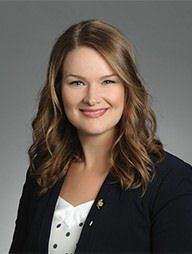 She assisted clients in enforcement actions with both state and federal entities to evaluate the appropriateness of proposed civil penalties, successfully advocating for reduced penalties in numerous instances. Outside of work, she is most likely to be found enjoying a good book or the outdoors in a host of different ways, many of them alongside her German Shepherd. She is an avid hiker, having successfully completed lead climbs of some of the Sierra Pacific’s most challenging rock faces, and enjoys deepening her yoga practice and baking.